If you're looking for somewhere to style your TV but don't have ample space available, we might just have the answer. 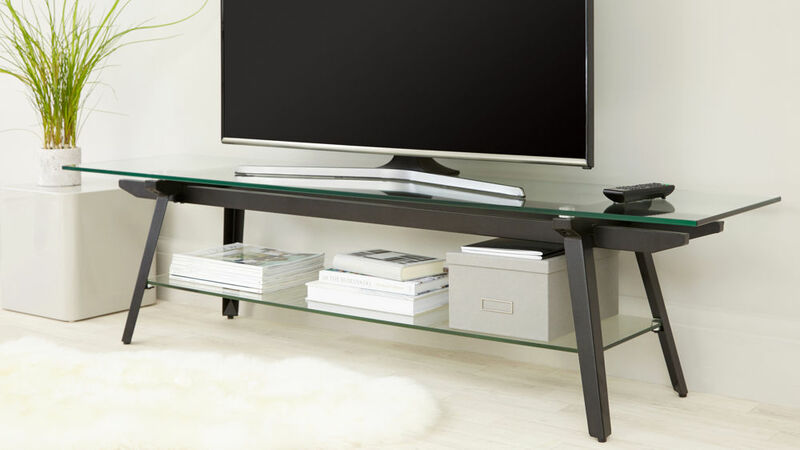 The Neo Glass TV Table combines two tempered glass shelves with black powder coated steel legs for a contrasting yet impactful design of TV unit. The clever sizing and glass shelving helps to create the illusion of more space while the coated legs are a great coordinating feature. 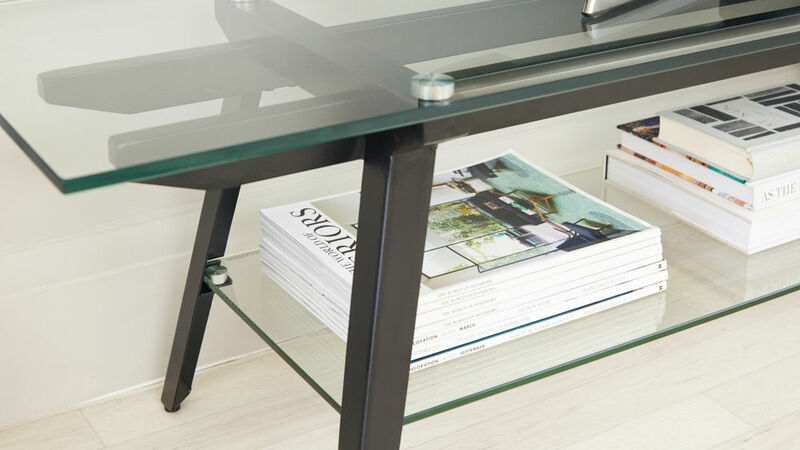 Whether it's space saving or designer style you're after, the Neo Glass TV Table ticks all of the boxes! 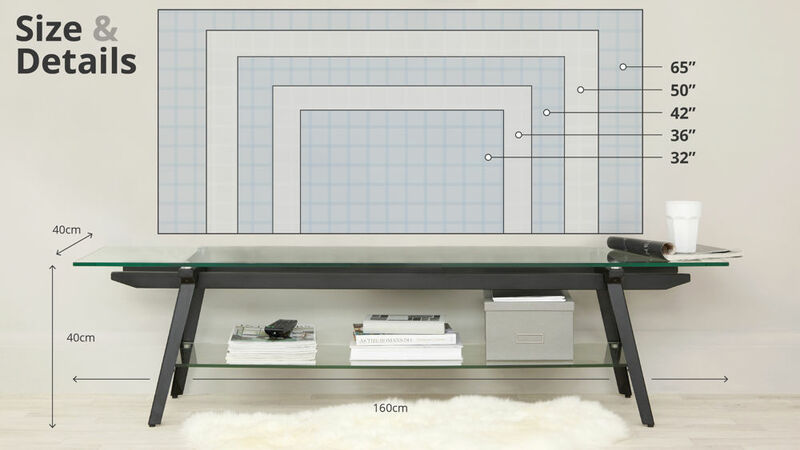 The Neo Glass TV Table measures 40cm in height, 40cm in width and 160cm in length. It's a medium sized TV unit that because of its style, has the appearance of taking up less space, making the Neo ideal if you don't want to overpower your room. The use of 10mm thick tempered glass makes the Neo TV table incredibly durable. Tempered glass is by no means fragile as it's toughened to British Standards, making it one of the strongest and safest surface materials you can get for the home. The table surface and shelf also have a bevelled edge which is slightly rounded. This helps to soften the look of the TV unit while also taking away any really sharp edges or hard corners. The Neo Glass TV Table can hold up to 50kg in weight. 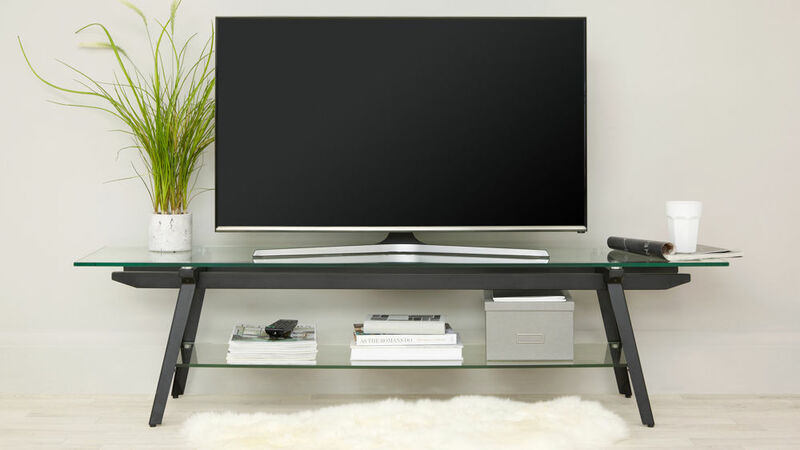 The average 32 inch TV weighs around 5kg and we recommend this TV table for TVs up to 65 inch, (the one in our image is 42 inch) meaning this unit is fully capable of supporting a whole variety of TV sizes and weights. There is no cable management in the Neo TV table making it ideal for storing wireless pieces or items that emit a fair amount of heat. The open back of this TV unit not only accentuates the visual lightness of this piece, but it will also keep your TV boxes and media equipment nice and cool as it provides plenty of ventilation. The legs and frame are made from hollow steel, finished in a black powder coat. This is a great feature on this unit as they're ideal for coordinating with your TV. Most TVs are black so it will tie the whole look together seamlessly. Compact and contemporary, the Neo Glass TV Table is a great way to add a crisp and modern look to your living room interior. 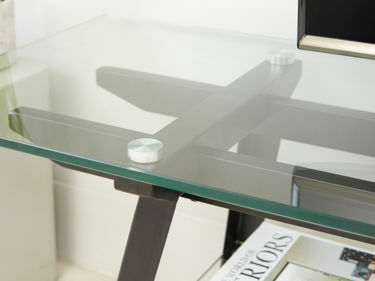 The stand out feature of the Neo Glass TV Table has to be its slimness and angular design. Because the legs are made from moulded panels of steel, you get clean, crisp lines without the TV table looking heavy or overpowering in your space. The tempered glass table top and shelf are extremely strong, sturdy and durable but are only 10mm thick, helping contribute to the Neo tables streamlined shape. The lower shelf on this unit is ideal for storing your TV box and remotes while the top surface provides plenty of room for your TV. Style this TV unit with our coordinating Neo range or add a mix of finishes to create a truly designer look in your interior.